Home » News and Views » Social Views » Where did all the skills go? Where did all the skills go? This is not so much a question but an all too frequent moan and groan we hear from clients and even end-users. We all like an unfounded blanket moan,: summers aren’t as hot, Chocolate Oranges are smaller, the England football team used to be so much better …. And the gripe about skills in our industry is no exception. It wasn’t so long ago that putting a BNC on a piece of RG59 cable would be a daily stock-in-trade of every CCTV engineer. Now, there is just as likely to be scratch of the head and search in the bottom of the toolbox for the ratchet crimp-tool should the need arise. Similarly, the phrases ‘lens tracking’, ‘protocol parity’ and ‘lens angle calculator’ are likely to produce a look of blankness (or maybe horror). But does that mean that today’s CCTV engineer is less skilled than five years ago just because these specific skills have dropped right down the list of essentials on a daily basis? Of course not, it’s about relevant skills. On cold mornings, my dad used to be a dab hand at starting our Morris Minor with a crank handle while wearing a special driving coat and driving gloves. That skill and his outfit now belong in a technology museum. 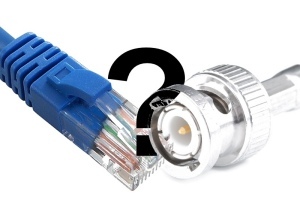 Today’s CCTV engineer might not have to fiddle with a crimp BNC connector but he might be facing the challenges of assigning an IP address, balancing network traffic, opening or closing ports on a router for a remote access system or integrating multiple systems onto a single coherent platform. No mean feat, any of them. Is it difficult to argue that the modern engineer is lacking skills then? So what is the cause of the gripes we so often hear and the wish for the return of the good ol’ days? The clearest reason is the obvious transition phase that our industry is in as we continue to move from an analogue to a digital era. No industry can change from one state to another overnight and expect a smooth skills transition. The nature of transformation means that at one point you have to be halfway; one technology is emerging while the other is dying out. Technologies emerge that help bridge these very different eras such as IP-down-the-coax and this helps the transition but also adds more learning in many cases. Engineers have all of a sudden to be a jack-of-all-trades. To make matters worse, in these phases it’s quite common to have competing methods of approaching a process. Once an industry has matured more there is likely to be a confirmed industry standard that can be both learnt and taught. It is not a question of systems integrators making up the rules as they go along; it is usually down to technology developments that mean the rules are in a state of flux until an industry stabilises. Who could have envisaged a cloud-based storage system when it seemed only yesterday that we looked excitedly at a modem chirping away as it dialled a connection? Is there a solution? The most obvious is something all companies should adhere to, and this is to not move too far away from their core skill set. Sometimes being a jack-of-all-trades is not a good thing. It is quite common for one company to be contracted to undertake the building management systems and this might include IT networks, telecoms, access control, fire and CCTV. It is also very common for parts of this contract to be sub-contracted to specialised companies for part or all of a certain discipline. The overall system implementation remains under the control of one organisation but specialists are able to work in their field with everyone’s confidence. It makes no sense for a CCTV company to think that its engineers can suddenly install a fire system as efficiently as a fire company (ignoring the obvious need for specialised training of course). None of this is new or quantum physics of course. Most successful companies recognise that this division of disciplines is the way to deliver successful technical and commercial results. But this basic specialisation of skills is not always the end of the story. So many elements can now feature in a system that there may be further requirements for additional skills to be drafted in and quite often the product manufacturers or vendors are able to deliver these skills. Consider a flame monitoring system at a petrochemical plant. On one camera position you may want to consider a thermal imaging solution and a video analytics system. These are two very specialised areas and not ones that your traditional engineer would be able to deliver. Can we really expect an engineer to be laying cable on Monday and adjusting an analytics algorithm on Tuesday? What is quite obvious is that there is no longer such a thing as an all-round CCTV (or fire or alarm) engineer. It is simply too much for one person to cope with. What we now see is an engineer with core skills and then the ability to project-manage other disciplines required to achieve an overall result. This is not weakness; it’s employing the right tools for the right job – the very principle of engineering. At ITS Products we can help you plug your gaps. We offer pre-assembly services on both analogue and IP systems. We can build up your camera assemblies in-house allowing you to get on with what you are good at. Our team has a very wide range of skills to meet all kinds of applications. From emerging technologies to products and systems that go back to the days when a Chocolate Orange was the size of the footballs our great England teams were kicking.